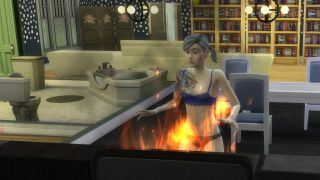 Just like real life, surviving and thriving in The Sims 4 can be hard. So a few Sims 4 cheats will help you get the best house, the friends, the dog, and make balancing all that with a career and experimenting with vampirism so much easier. Luckily the boffins at EA have had mercy on us all, building in a bunch of cheat codes to help you shortcut your way to slaying as your sim self. Before you can enter any Sims 4 cheat codes, you need to bring up the not so secret cheat option. PC: Hold CTRL and Shift, then press c.
Mac: Hold Command and Shift, then press c.
PS4: Hold down all four shoulder buttons at once. Xbox One: Hold down all four shoulder buttons at once. To get 1000 simoleons type "rosebud" or "kaching"
To get 50,000 simoleons type "motherlode"
If for some reason you want a Sims 4 household to have an exact amount of money, you can type "testingcheats true", type in "Money X" but replacing the "x" with a number. If you're looking to upgrade your living quarters, you can make all the lots in a neighbourhood free with the cheat code "FreeRealEstate On". Turn it off with "FreeRealEstate off". To make a sad Sim happy open up the cheat bar and type in "testingcheats true". Then hold shift and click on the Sim you’d like to change the needs for, and select "Make Happy". To unlock special career items in the building mode, go into build mode, open the cheat box and type "bb.ignoregameplayunlocksentitlement". Why work hard when you can work smart? To show hidden items in the build / buy catalog type in "bb.showhiddenobjects". Tired of doing the dishes? Want to torture your neat freak Sim? You can change the status of an item. Open cheat console, type in "testingcheats true", and while holding down shift click on an object and chose either "Make Dirty" or "Make Clean".